When we were at Guédelon, the medieval castle being built in modern Burgundy, they told us that during a recent renovation, modern equipment reached many meters deep into the interior of some of the walls of the Roman Arena at Nîmes and discovered that the 2,000 year old mortar had still not quite dried. This is part of what allows the structure to withstand all the rigors of time, and also what draws me to the Nîmes Arena. It's not all 2000 year-old mortar, of course. There have been some renovations along the way. And some cleaning up. It's pretty easy to tell where the latest power-cleaning stopped. Some internal scaffolding helps hold it up. The audioguides tell the stories -- many gruesome -- of the gladiator fights held here. The girls are a combination of interested, bored, and grossed out. Anthony is purely enthralled. This is the kind of place where is his inner 12-year old runs wild. It's a pretty far climb to the top, but well worth it for the views, both outside and inside the arena. When we are there, they offer gladiator fights -- not to the death, of course, though we do see a little blood drawn (by accident, I assure you, but still a natural byproduct of going at each other even in mock combat). In case you're wondering, Gigi -- who would not stomach a bullfight for all the gold in Fort Knox -- is OK with the modern gladiators fighting because a) both are human and on even footing and b) the intent is not actually to kill, or even injure. She's understandably repulsed by the ancient version of it but enjoys trying out the weapons and shields as much as the next guy (who happens to be Pippa). The arena closest to home is the Arène de Lutèce; little known even by tourists, there's an ancient Roman arena in the middle of Paris. Don't feel bad if you've never noticed it there, the Parisians didn't notice it here, either, for many hundred years, until construction in the area in the 1860s uncovered it after having been buried since the 1200s (built in the 1st century). Now what remains of it is used as a public park. 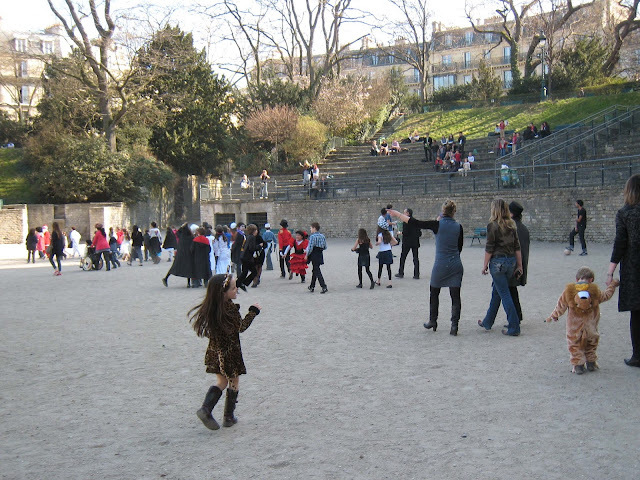 Along with the inevitable pétanques (bocce balls) and soccer players, we've also watched outdoor movies, picnicked, attended small concerts, learned about gladiators, and had costumed school parades here. What remains is not the most impressive arena, but it's somewhat impressive in general that there is a 2000 year old arena, still being used, right in the heart of Paris. Admittedly, none of these French arenas is as famous as the Colosseum, which we saw earlier this year on our trip to Rome. 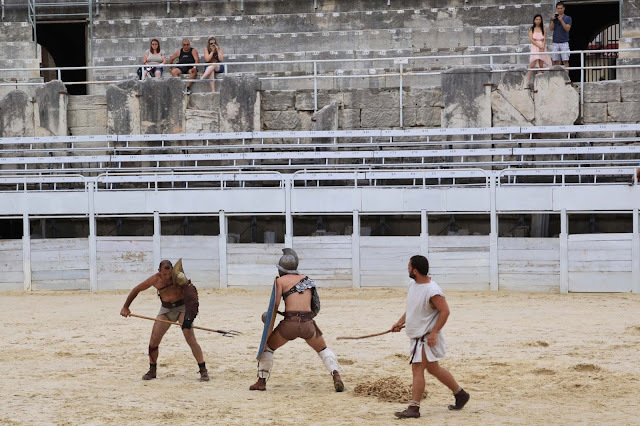 It may not be as iconic, but I will say that the arena in Nîmes, while not as big or as famous, is much better preserved. The Colosseum is a real ruin. Nîmes and Arles are certainly the most impressive arenas in France. But there are others, generally less remarkable or more ruinous, and of these, a few are worth a small detour, if you're in the area: Bordeaux, Nice, Saintes, and Fréjus, especially. In some of these 2000 year old structures, the mortar may even be dry (or, if not, it will probably set in another thousand years or so). Ovalie Romarin is named after romarin -- rosemary, and also its shape, roughly an ovale. It's a raw goats' milk farmhouse cheese, made at the Fromagerie du Petit Champ ("Cheesemaker of the Little Field") in the department of Deux-Sèvres, in the region of Poitou-Charente, home to so many great goat cheeses. It's not only a farmhouse cheese made at the Fromagerie du Petit Champ, it's a farmhouse cheese made only at this fromagerie, as far as I can tell. It's sold in a few of Paris' high-end cheese shops, but there's little mention of it anywhere else. So little, in fact, that I'm including the photo of the sign just to confirm I'm not making it up. If you try to research it, you will come across a cheese called plain old "Ovalie", which is a sheeps' cheese from Corrèze and not related at all to this Ovalie Romarin. Once you break through the delicate skin, Ovalie Romarin is a soft, oozy, buttery goat cheese. It's just the right combination of salty with a hint of the rosemary that decorates the top. It's not super herby, but it is super yummy. First of all the classic French cheese Ovalie Romarin is an oval shape (or fairly oval, hence the name), just like a classical Roman arena in France. Sure, the translation really means "rosemary" oval, but in both French and English, it sounds almost like "Roman": "Roman Oval" would be "Ovale Romain" in proper French. So this is about as close to an arena-shaped and arena-named cheese as you can get.